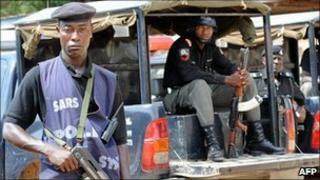 At least 32 people have been killed in bomb blasts in central Nigeria. The bombs were detonated during Christmas Eve celebrations near the city of Jos. No group has said it carried out the attacks. The blasts happened in an area that has seen up to 1,000 people killed this year in sectarian clashes. In a separate development, at least six people have died in attacks on churches by suspected Islamists in the north-eastern city of Maiduguri. Gregory Yenlong, a spokesman for Nigeria's Plateau state, said there had been long-standing threats against the region's Christian community. "For the past two weeks there have been threats to disrupt Christmas celebrations in Jos," Mr Yenlong told Bloomberg news agency. About 74 people were wounded in the bomb blasts. Some are in a critical condition. Jos lies on the fault-line between Nigeria's mainly Muslim north and its largely Christian and animist south. Although clashes take place between rivals gangs of Muslims and Christians, observers say the underlying causes are economic and political. Muslims are generally from the Hausa- or Fulani-speaking communities. They are often nomadic people who live from rearing animals or petty trade. The mainly Christian Berom, Anaguta and Afisare groups have traditionally been farmers. Some Christian farmers feel they are under threat, as Hausa-speaking Muslims come down from the north looking for pasture for their animals. In Maiduguri, suspected Islamist sect members attacked at least two churches late on Friday. In one incident, petrol bombs killed five people including a Baptist pastor, Reuters news agency reported. A security guard at a nearby church died in a similar assault, Reuters added.